Update – May 6, 2015: We’re pleased to announce that we’ve released updated versions of the Word, Excel and PowerPoint apps for Android with two enhancements: (1) Support for Intel chipsets with a native implementation; and (2) Support for Android Lollipop. The updated apps were released to the Google Play store on May 5, 2015. At Microsoft, we are working hard to reimagine the Office experience for a cloud-first, mobile-first world. On January 21st we previewed versions of Office for Windows 10 fully optimized for touch and mobile devices. 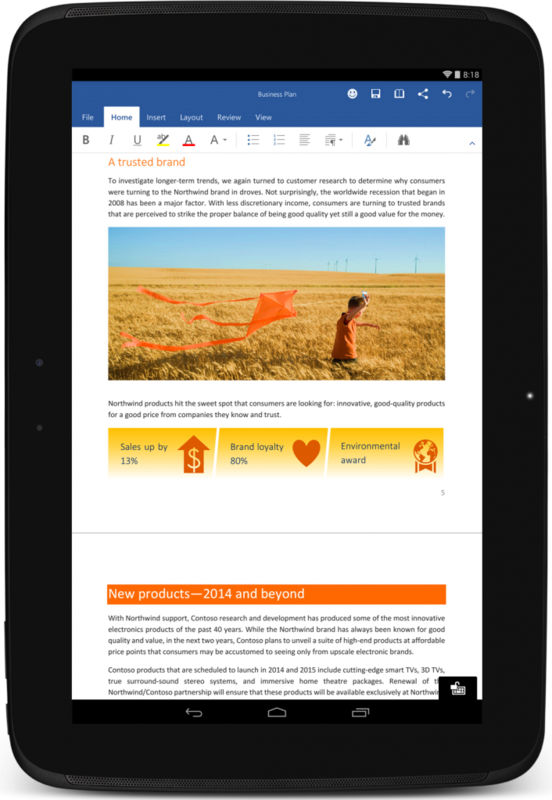 Today, we are proud to announce the general availability of Word, Excel and PowerPoint for Android tablets. 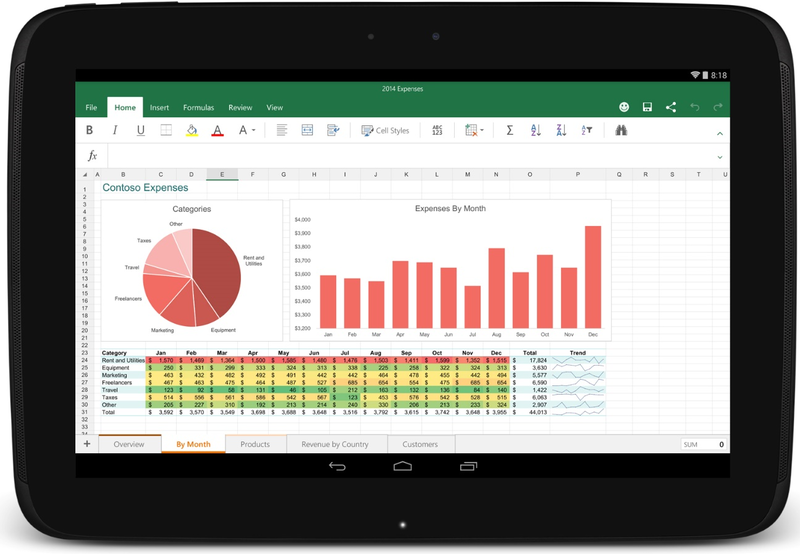 Similar to Office for Windows 10, Word, Excel and PowerPoint for Android tablets are built from the ground up for touch and are perfect for mobile productivity. Consider a pharmaceutical sales rep on a train in Chicago, updating her monthly budgets in Excel. Or a student in a Madrid coffee shop writing a paper in Word, while collaborating with other students back at the dorm. Or a consultant from Bangalore at his client’s site, wirelessly projecting a PowerPoint presentation to a large screen. These are just a few scenarios our engineering teams anticipated when we designed the apps—for touch, on the go and tuned for Android tablets. 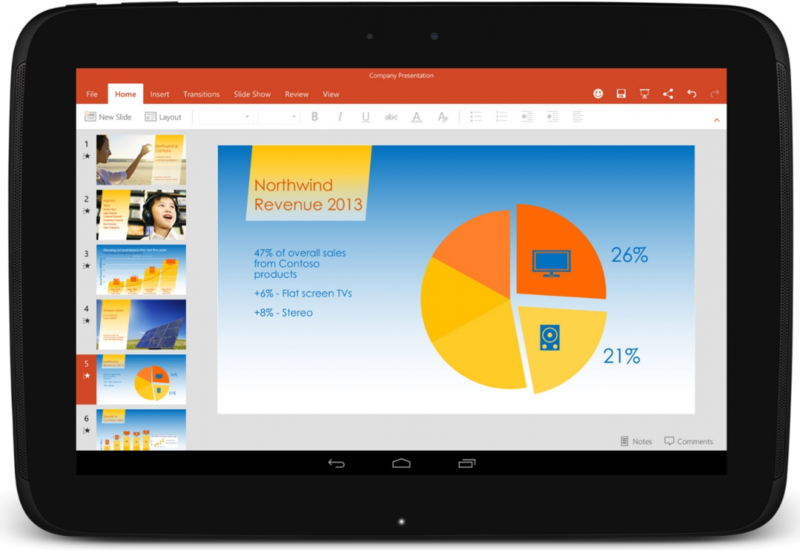 We designed these apps to be unmistakably Office, while optimized for Android tablets. Customers will immediately feel familiar with the Office ribbon. Large touch points make it easy for even the fattest of fingers to navigate commands. External keyboards can be connected but certainly aren’t needed. Existing documents open and render beautifully and are accessible instantly from device to device via a roaming “most recently used” file list. I want to take a moment to acknowledge all the preview users who participated and offered feedback–thank you! The three-month preview program was incredibly important to our development efforts–not just in generating helpful ideas, but also in testing the apps on the wide range of Android tablets across the world. The preview program itself generated more than 250,000 downloads for all the apps across 33 languages in more than 110 countries. We had 3,000 Android device variants covering more than 500 models with different sizes and hardware capabilities. There was high engagement with 80 percent of people trying the apps. With 30,000 active users in various communities, we received a constant flow of feedback. We appreciate our customers rating all three apps above 4.2 in the Google Play Store–thank you! Please download Word, Excel and PowerPoint from the Google Play store today! We hope you love them as much as we have enjoyed building them for you.